Size: 5.8" x 3.3" x 1.4"
The Canon LE-82 uses the housing of the LE-80R but replaced the square-root functions with a [%±]-key. From the technology the LE-82 is similar to the SR-10 introduced by TI few months earlier. 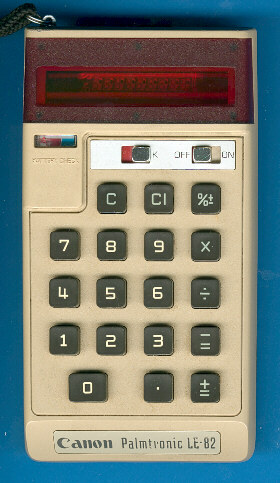 Another calculator using the TMS0128 could be found with the JCE Percent. In 1974 Canon introduced with the LD-80 their first pocket calculator with the green VF-Display (Vacuum Fluorescent) and stopped the LE-series.